For this month's "Maps Of The Month" featurette, I wish to draw your attention to BumFengShui's Tony Hawk's Pro Skater 2 (GBA) maps. Summer is upon us! Bust out your boards, or this sick GBA game! Despite being technically 2D, the isometric perspective does a good job of conveying the three-dimensional landscapes of half-pipes and ramps. From the Hangar to the Warehouse, from the streets of New York to a skate park in France, there are all sorts of opportunities to shred and grind and all the other things you can do with a skateboard! Fun fact: Tony Hawk's Pro Skater 2 is considered one of the best sports games ever, and according to Wikipedia, shares this recognition with Pong, Mike Tyson's Punch-Out! !, NBA Jam and Wii Sports, all games that not-really-sporty gamers (like myself) can, and most certainly have enjoyed. And we can enjoy this game on the go, and also now with a deep understanding of all the skateable areas of this game, thanks to BumFengShui. Hit all those crates and spell S-K-A-T-E! 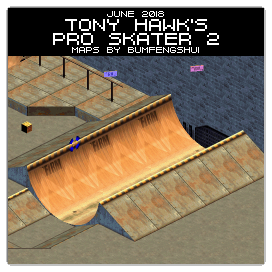 So the recognize the effort put into mapping this GBA launch title, BumFengShui's Tony Hawk's Pro Skater 2 (GBA) maps will be known as VGMaps.com's Maps Of The Month for June 2018.